AK4062 Light Dust deposit 35 ml. The perfect product to recreate accumulated dust and dirt on your model. This Sand Yellow enamel product is perfectly suitable for vehicles operating in a desert environment or any light soil area. The finish is extremely authentic. 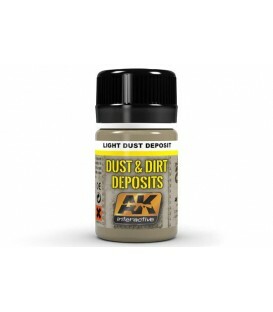 The perfect product to recreate accumulated dust and dirt on your model. The finish is extremely authentic. The perfect product to recreate a rust texture in a medium rust color in surfaces of vehicles or accessories. Once they are dry, they have the same scale appearance as real crusted rust. The finish is extremely authentic and can be combined with other tones for more realism. The perfect product to recreate a rust texture in a dark rust color in surfaces of vehicles or accessories. Once they are dry, they have the same scale appearance as real crusted rust. The finish is extremely authentic and can be combined with other tones for more realism. AK675 Decay deposit for abandoned vehicles 35 ml. This deposit formula has been developed to give our models an appearance of decay over the surface of abandoned elements, vehicles or buildings. The finish is extremely authentic.